We have been living through another heatwave and facing catastrophic fires conditions; Code Red for 3/4 of the state yesterday. Just crazy; my brother is snowed-in in London and friends on holiday in Hamburg have been experiencing record snow and lows! Too hot to cook? Bring on the burrito. The only cooking required is a few minutes on a hot pan per tortilla and some pan cooked meat if you want it. Perfect vego food. Raw and healthy. Its B2s favourite dinner. 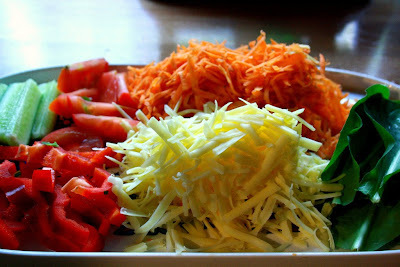 Grated carrot and cheese, strips of red capsucum, cucumber, diced tomatoes and lettuce. Easy garden fare. Topped off with yoghurt guacamole spruced up with loads of chopped coriander, spring onions and chilli and if you like, some free range spicy chicken pieces. If you're using store bought tortilla breads, then you have to give these a go. 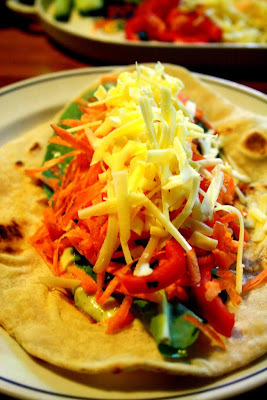 The day i tried my own tortilla bread i was a convert to the extra half hour investment. 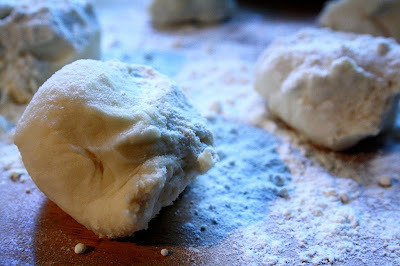 You won't believe the difference; flaky but feather soft and much more filling than store bought breads. I gave up the store bought breads for a few reasons mainly due to the plastic packaging and the distance traveled to get here and then there's the preservatives and basically, lack of quality product. Hmmm, tortilla for breakfast sounds goooood. Yum! So can I be cheeky and ask) what is your recipe for tortillas or is it a take it to the grave recipe? Are you channelling my mind??? Scary. 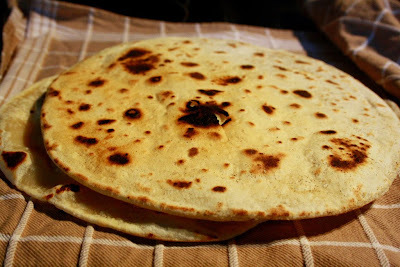 Home-made tortillas are fantastic! Was thinking of making them again the last few days and decided to make them for lunch today. Great piccies. 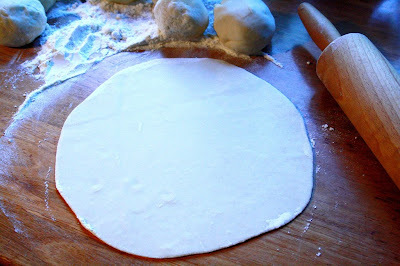 Tortillas look fantastic! What recipe did you use? River Cottage? Sometimes I think you read my mind too, we had tortillas last night which did not fit in with my 100 mile challenge so I was think I should find a recipe et voila - you gave me one. Hope they're as good as the afternoon delight biccies, they are a big hit around here. hehe..i could eat these every day for dinner i think..never boring! I've been trying to leave a comment for the last couple of days (computer problems) about the tortillas which we've also been eating a lot of the last few months. They are so good! The cute guy makes them. And I love that you're also eating them on the other side of the world. We've been using vegetable shortening and/or butter but now we're going to try your oil method. Thank you. Tortilla's for dinner last night. Oh boy, oh yum. I might be heading towards the great-grandmother age but I enjoy trying new recipes especially easy ones. The tortilla recipe is a ripper! margaret- hi, so glad you enjoyed them. They dont look like much but really are a taste sensation arent they? Love that...ripper! but they are arent they? i saw these at if only i had chocolate & had to come by & drool! love them & will try it out, thanks. I'm definitely on board for trying this. It's been years since I made my own tortilla's.